Scientists are seen quite differently depending on the views and beliefs of the groups a person belongs to. This ranges from evil heretics (in the mind of religious fundamentalists) to wasters of public money (by the ultraconservative right-wings) to problem-solvers for pragmatic people all the way to being seen as ivory-tower thinkers entirely detached from the world down below. None of these views is entirely correct but except for the far extremes on both sides individual scientists fitting the bill can be found for everything. How is this group defined? Scientists are very inhomogeneous and I will focus mainly on these that have the greatest connection with personalised medicine, i.e. life sciences in bio-medical research. This includes both MDs in research as well as biologists, biochemists, chemists, bioinformaticians, and computer scientists. What are the major roles of this group in personalized medicine? 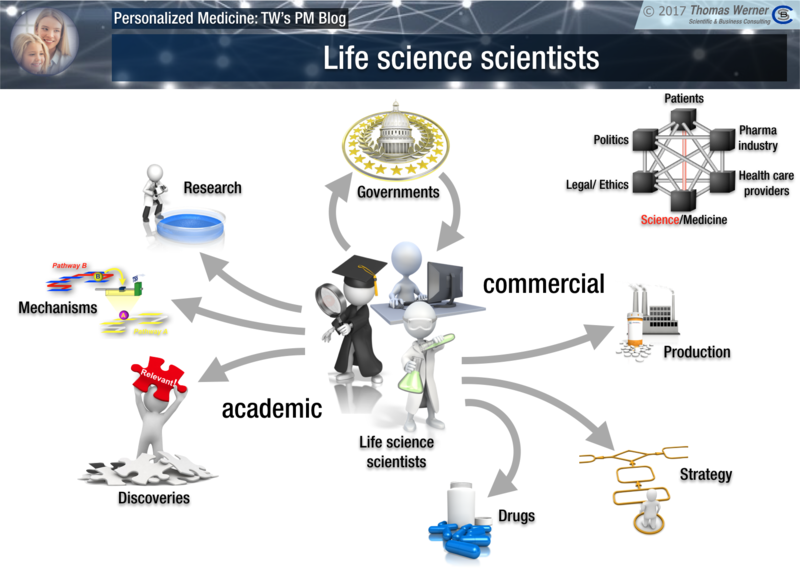 There are three major columns of research important for medicine in general and personalised medicine in particular: Discovery of health and disease mechanisms, discovery and testing of new compounds and drug candidates, devising and scaling up of production methods for promising new drugs. All three are the realm of the scientists mentioned above. 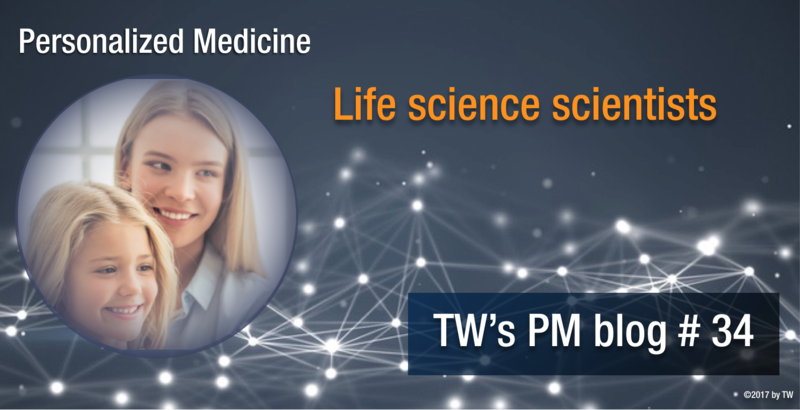 What is the major impact of this group on the development of personalized medicine? Scientists are the driving force behind the acquisition of new, especially molecular, knowledge about how our organism works. They also represent the spearhead of cutting-edge developments in the pharma-industry and the rather recent biotech-industry. Scientific discoveries almost invariable come at a significant cost for research. They may later on actually help to save not only lives but also money. The big problem for investors is the imbalance between the rocksolid reality of the upfront costs involved and the “maybe” for the return off investment later on. However, discoveries cannot be guaranteed to yield financial gains. There is always the risk to fail, which on the other hand is the only way to learn. Nobody learns from success but keeps repeating the same scheme over and over again - till it fails. With whom has this group the most important interactions? Scientists heavily interact with other scientists in a mixture between competition and cooperation driving scientific developments. The home of the “pure” researchers is usually a university or a research institute (governmental or private) not aiming for profit. The more applied researchers can be found in the biotech and pharma-industry. Their work is always under financial scrutiny by the managements of these companies looking for short-term return of investment. Scientists are also called on by other stake-holders such as politicians and governments to testify as experts in political discussions, usually with rather limited impact. Especially bio-medical research is often brushing with ethical considerations. This is why scientists (at least in Germany) always need ethics committees to approve of their planned research upfront. What is required of this group to further the development and application of personalized medicine? Scientists are pivotal to develop and shape the basic paradigms used to further medicine and biomedical research and application. For decades the prevalent paradigm was one gene - one function, and one compound - one drug - one disease. Based on recent discoveries (recent going back two decades in this case) the paradigm came under fire. Today we know that this is basically the opposite of what biology really is about. Everything is linked, nothing works in isolation. However, a large fraction of biotech and pharma-industry is still reluctant to abandon that old paradigm mainly for monetary reasons. If multiple components with a variety of effects enter the picture patent issue become much more complicated. This hits the lifeblood of pharma-industry generating high resistance. It is the responsibility of the scientists to convince the industry that biology cannot be adapted to their business models but they will have to adapt those to biological facts. Ignoring this fact will stall biomedical progress and cost lives. Next week we will come to thorny issue - data protection. Seemingly there to protect people from big brother, too rigid data protection may actually harm the very same people it is meant to protect.